How Many Calories Does Celery Have? 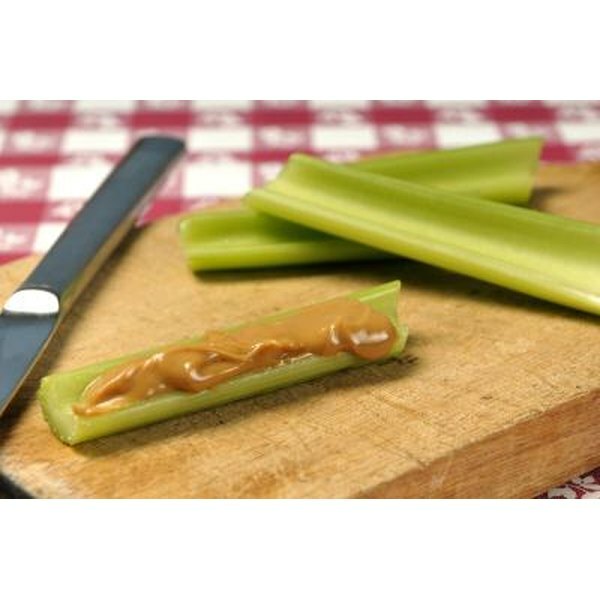 Celery with peanut butter is the traditional base of “ants on a log,” a classic children’s snack that provides a hefty dose of nutrition and creativity. But far from being just for children, celery and peanut butter is a combination that has a range of health benefits for people of all ages. Eating celery with peanut butter provides a balance of all three essential nutrients: protein, carbohydrates and fat. While celery has almost no protein or healthy fats, peanut butter has both. According to the USDA, one large stalk of celery has just 10 calories, 0.5 g protein, no fat, 2 g carbohydrates, 1 g fiber and 1 g natural sugar. Two tablespoons of smooth peanut butter have 190 calories, 8 g protein, 16 g fat, 6 g carbohydrates, 2 g fiber and 3 g sugar. Of the 16 g fat in the peanut butter, 3 g are saturated. Celery and peanut butter both have qualities that encourage feelings of satiety, which makes them an ideal snack if you’re watching your weight. Celery has a relatively high amount of fiber per serving, and fiber-rich foods tend to take longer to chew and digest. Peanut butter, alternately, has enough protein and healthy fat to promote lasting satiety, according to University of Nebraska registered dietitian Alice Henneman. In fact, according to 2003 research published in the “European Journal of Clinical Nutrition,” increased nut consumption was associated with decreased body mass index. Snacking on peanut butter and celery may also improve cardiovascular risk factors. According to ChooseMyPlate.gov, fiber-rich veggies such as celery have the potential to reduce blood cholesterol levels and heart disease risk. Nuts have heart-healthy unsaturated fats, the type of fats that lower LDL cholesterol, lessen the risk of blood clots and make the linings of your arteries healthier. Providing a balanced package of protein, carbs and fat isn’t the only nutritional advantage that peanut butter and celery can offer. According to the USDA National Nutrient database, celery contains vitamins A, B, C and E and the minerals calcium, magnesium, phosphorus, potassium and sodium. When you cook the veggie, it loses much of its vitamin B and E, so eating it raw with peanut butter provides a definite advantage. The American Peanut Council adds that peanut butter is a valuable source of folate, vitamin E, niacin, thiamine, riboflavin and vitamin B-6. Lancaster.UNL.edu; Nuts for Nutrition; Alice Henneman, R.D.